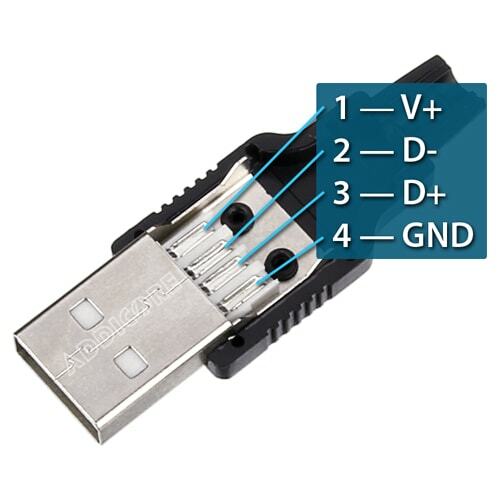 Make your own USB type-A plug connector. Just solder your wires to the inside terminals and squeeze the two plastic halves together. The halves have pegs which hold the halves together reasonably well but if you want you can glue the halves together for a permanently assembled plug. Worked great, I cut off the broken end of a older damaged iPad cable and installed this to power a breadboard power supply. I only soldered the VCC and GND, didn't need the data wires. There seem like a cool item, but unfortunately the opening in the back of the plug is too narrow for full sheathed USB chord.